San Angelo's historic murals are possible because of the support and donations of our wonderful local citizens. We are also proud of our artists and the outstanding work they have created. HMSA does not receive funding from city, county, state, or federal entities. We are not affiliated with any other non-profit organizations in town. Contributions to HMSA are dedicated entirely to our mural and facade projects. We invite you to be a part of our supporters. In 14 years, it has taken over $500,000 to bring these murals to the community and our website visitors. We look forward to YOU becoming our newest supporter. All donations to Historic Murals of San Angelo are tax-deductible. The three-panel military mural includes separate paintings representing Historic Fort Concho, the San Angelo Army Air Field, which is now Mathis Airport, and Goodfellow Air Force Base. This group is one of our most popular visitor choices since the community has had such a close relationship with the military for its entire existence. As a tribute to this community connection, Historic Murals of San Angelo has arranged commemorative bricks all along the top and down each side of this huge mural as a way of paying tribute to the military service of all veterans. 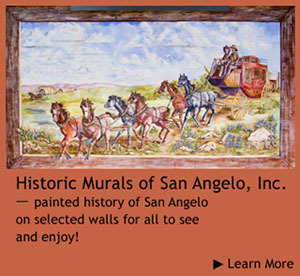 The historic murals shown on this website and painted on the walls in San Angelo are copyrighted jointly under US Copyright Law with artists Stylle Read and Crystal Goodman and Historic Murals of San Angelo, Inc. Any use of them by any means without permission from HMSA will be in violation of the law.